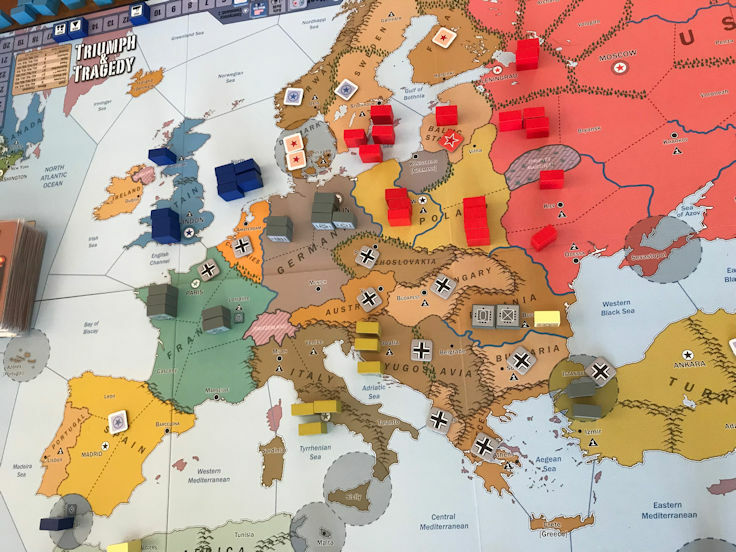 For many wargamers, Avalon Hill's Third Reich (or the advanced version of it) is THE simulation game of what happened during World War II at the strategic level. Its standing has never been shaken through all the years. It is just like Advanced Squad Leader, as to the tactical level, admitted into the shrine of sanctity, for everyone's consecration. So when Triumph and Tragedy came out, I was unmoved and unsuspected, thinking that it was yet another trendy, simple block wargame. It turns out that I was wrong in the perception when one of our members took the game to the club for a game. I took the opportunity to write this review, with the aim of summarizing what actually happened in a game turn. Triumph and Tragedy is one of the rarer games recently for which I found instant love, despite not being a big fan of block wargames. 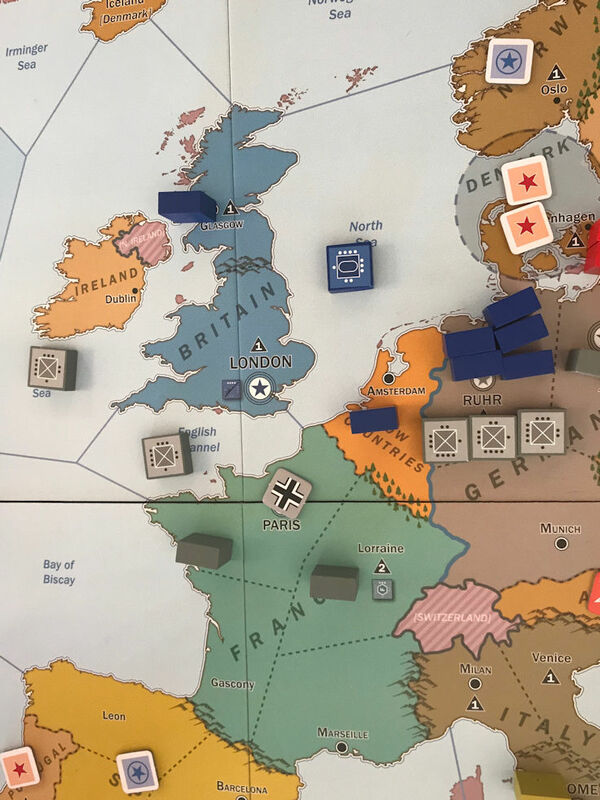 The base engine is beautifully constructed, such that details in political, economic and military aspects of WWII are carefully woven together, without many exceptions to tinker with in the core rules. A clever and robustly workable strategic framework for a game. 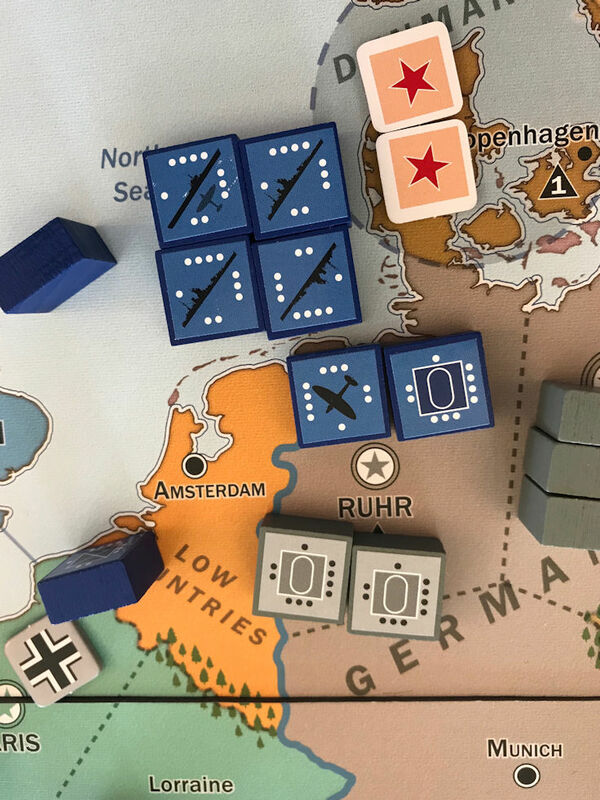 When compared to Victory in Europe, a sibling block design by designer Craig Besinque's former partner in Columbia Games, Triumph and Strategy is obviously much more efficient, smooth and fun to play. The framework seems to be open enough for the players to change the course of history in WWII, and yet the changes are plausible. Many are familiar now with the "blocks" system, which denotes a unit strength by pips on the edge of the block. Triumph and Tragedy also utilizes such system, as each side sets up its units at "cadre" strength (one pip denotes combat value of one) in its cities. Maximum strength for different types of units is therefore four, with four pips. Unit types include infantry, tank and fortress on the land, air force in the sky, fleet, carrier and submarine at sea. Unlike many other block games, there is no combat rating, e.g. A, B, C, D, etc. to determine the sequence of battle. Rather, a Unit Table determines Firepower for each type of unit when it fires, according to the target. For example, a Fortress unit can fire at an air force with a firepower of two, at a fleet with three, at another land units, with four, and at a submarine (yes, they can fire at submarines!) with three. The colours of the blocks determine nationality of the units. They look very good and colourful on the map when they are set up. 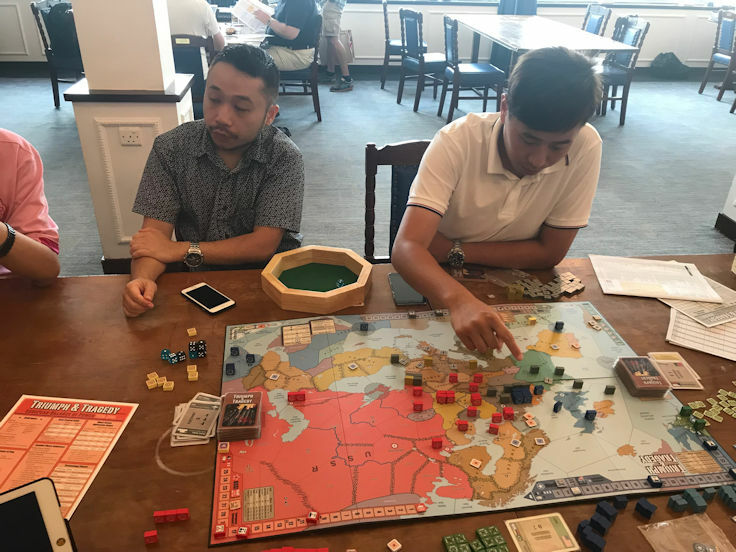 One of the great features in this game design, is its diplomacy system, which is straight-forward to execute and genuine to the political situation and agendas at the time. You add influence markers to the neutral space during diplomacy resolution in the Government phase, if the Action cards you played are not cancelled by another Great Power. The neutral country you have influence in would become either Associate (1 influence), Protectorate (2 influence) or Satellite (3 influence) country of your power. The country remains neutral in all three states and their Population and Resources are controlled by the influencing power (i.e. adjustment on the Production track). For Associate or Protectorate, the influencing power cannot send in the units without violation of its neutrality, but if Satellite, the power can place units onto the capital, city and town immediately. The other two powers can no longer attempt to influence the country anymore and any attack on the Satellite causes a Declaration of War (DoW) on its controlling power. In my view, the complicated politics pre-WWII is simulated here beautifully. Imagine the West makes Czechoslovakia into Protectorate and Poland into Satellite, just like what happened in WWII, the cloud of war would loom all over Europe. The definition on the state of neutral country is a very interesting and authentic political mechanism as I have ever seen. Effects of investment into technology are described on the Investment cards themselves directly and so it is quick and easy to understand, without full pages of rules. Normally, you obtain the effects of a technology immediately by playing and then discarding two of the same Investment cards. But you can also place the technology inside a "Secret Vault", i.e. not revealing what it is immediately, and play it anytime later, with a surprise effect on the units. For example, you can reveal two investment cards with "Sonar" technology immediately and thus all Fleet units gain S3 vs. submarine units. Or you can play the technology only when there is a naval battle happening on the area. A secret vault, however, counts against a power's hand size limit. The meaty part Seasons (in the game it is not called a phase as such like Production or Government) comes after the conclusion of Government Phase with a check on hand size limit compliance. There are Spring, Summer and Fall seasons in which Command phase is performed by each player to conduct movement and combat on the map. Factions at war must conduct supply checks for land units during the Supply phase at the end of each season. Only USSR undertakes Winter season with a Command and Supply phase. To be in supply, a unit must trace a Supply Line (continuous friendly areas) back to the faction's source of supply, which is its main capital or sub-capital for the faction). The effect of a unit being out of supply is that it cannot be built further, i.e. increasing its step, and suffers one step loss. Simple and effective supply rules. POP/RES sources currently unable to trace a valid Trade Route back to the Faction's main capital are subject to enemy Blockade during the Summer. Since the Trade Route is made up of friendly and neutral territories, that means it can pass through neutral countries like Associates and Protectorates. Combat occurs when rival factions units are present in the same sea or land territory. The Unit table determines the order of firing, unless units are equipped with technology, which gives First Fire capability fires first. The sequence of fire is fortress, air force, submarine, fleet, tank, infantry and convoy. Players familiar with other block game systems should have no problem with the combat system in Triumph and Tragedy, and should know that the sequence of fire is critical for combined arms operations. A unit can retreat before its turn to fire. A land battle can be resolved over several players' turns, but a sea battle is always resolved during a player's turn until one side is retreated or eliminated, thus the sea area is vacant of enemy units. A unit scores a hit on the enemy unit if it rolls a die equal to or less than its firepower vs. the target type in the Unit table. A hit causes a unit to rotate to its next side with one fewer pip. It is not surprising to see that a game as ambitious like Triumph and Tragedy, attempting to lever up political, economic and military with each other in one single system, would have three kinds of victory conditions as well. If you are a traditionalist going military, you can win by conquering two rival main or sub capitals at the same time. This is a very dangerous victory condition as it may occur at any time when one is careless in his defense deployment. 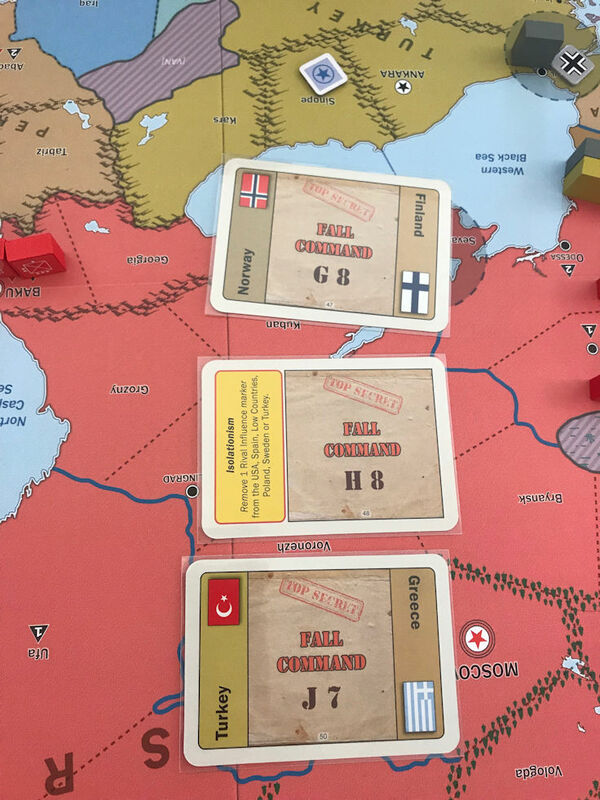 In our FTF game, the Axis (Alvis) won the game suddenly when he found the opportunity to conduct Operation Sealion against U.K. and captured London successfully with an amphibious landing. With Paris already at hand, the Axis declared a military victory. The West (Angus) was busy himself with a possible counterattack on the continent, where USSR (me) was steam-rolling his military might across Europe. 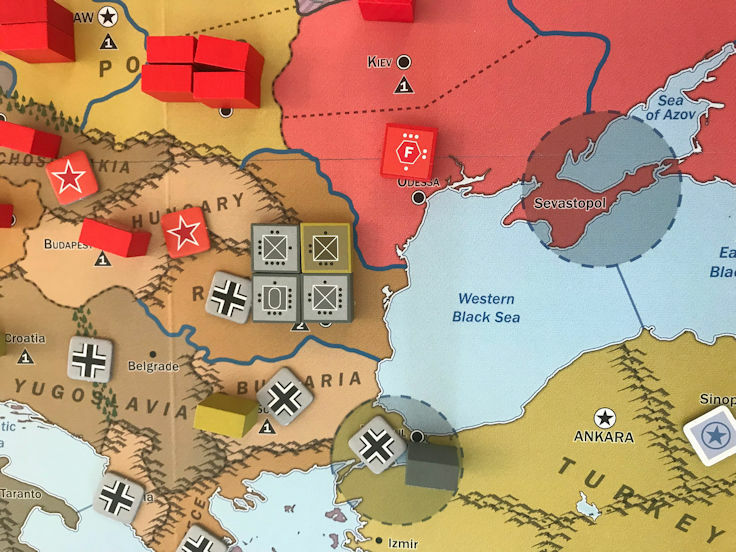 The game can have only one player victory and hence the West and USSR are actually competing for the capture of Berlin. Certainly this experience is not new to me as I faced the same in Victory in Europe, another block grand strategic wargame on WWII! On the other hand, Economic victory can be achieved when a power has gained 25 victory points at the start of a new year. The calculation of VPs is current Production Level +1 VP per Atomic Research level revealed, +2 VPs foe each Enemy main capital or sub-capital controlled, + Peace Dividend values revealed, -1 VP per DoW issued. Since Atomic Research and Peace Dividend can be hidden from other players, there is a certain amount of uncertainty involved as to when a power has actually achieved 25 VPs. Of course, if there is a large chunk of land that has fallen into the hands of a particular power, chance is that that power could have won the game sooner or later. A Peace Dividend chit is randomly drawn at the beginning of a new year as long as the factions stay in "peace". Nonetheless, half of the chits pay out zero dividend. Of the total 32 chits, 12 (37.5%) have a dividend of one and 4 (12.5%) have a dividend of two. I have seen an Axis player who kept accumulating the VPs via peace dividend and did not go to war with anyone. Finally, a power which invested in and completed the research of the A-Bomb to its "4th level", and which is available to "deliver" the bomb by air force to a rival main capital within its movement range, can declare Atomic Victory. Finally, if none of the powers can garner any one of the above three victory conditions, a power can win Economic Hegemony with the highest number of VPs at the end of 1945. So this is about how a game of Triumph and Tragedy runs. It is amazing to see designer Craig Besinque come up with a robust framework, yet flexible and resilient enough to give WWII a "sandbox" mode. Some people say that Triumph and Tragedy looks like a game on fantasy lands, as things might happen a lot differently from the historical way. But I say this is a great design, in which things could certainly happen in an alternate or parallel universe! Overall, a great design and a great game that is fun and challenging for three players, and that can be completed in one sitting. One of the best games I played in 2018. I expect to play it a lot and so I find my bucks (I got it for US$80) worth very well the price.